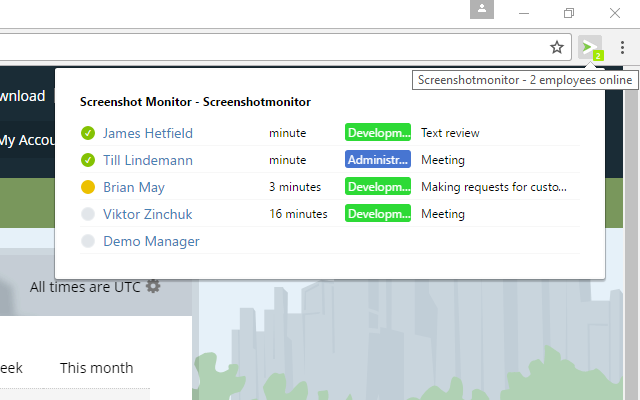 If you are a manager and you are using the Chrome browser (Firefox is coming later) – these’s no need to go to ScreenshotMonitor.com just to see who is working on what any more. Install ScreenshotMonitor Chrome extension and it will add a button to Chrome. The number on the button shows how many employees are currently active. And if you click it, it will show all of your employees, who is currently active, when they have worked last, what project and the task. Why Do You Need Automatic SQL Server Health Checks? What is the best email configuration of Google Apps for a small company? How to create a page without a sidebar in WordPress? How to detect Employee Monitoring? Wojciech on How to create a page without a sidebar in WordPress? Ruslan Sudentas on What is the best email configuration of Google Apps for a small company? Sergey on What is the best email configuration of Google Apps for a small company? Sulabh Sharma on How to create a page without a sidebar in WordPress?